1 ESGE recommends endoscopic en bloc resection for superficial esophageal squamous cell cancers (SCCs), excluding those with obvious submucosal involvement (strong recommendation, moderate quality evidence). Endoscopic mucosal resection (EMR) may be considered in such lesions when they are smaller than 10mm if en bloc resection can be assured. However, ESGE recommends endoscopic submucosal dissection (ESD) as the first option, mainly to provide an en bloc resection with accurate pathology staging and to avoid missing important histological features (strong recommendation, moderate quality evidence). 2 ESGE recommends endoscopic resection with a curative intent for visible lesions in Barrett’s esophagus (strong recommendation, moderate quality evidence). ESD has not been shown to be superior to EMR for excision of mucosal cancer, and for that reason EMR should be preferred. ESD may be considered in selected cases, such as lesions larger than 15mm, poorly lifting tumors, and lesions at risk for submucosal invasion (strong recommendation, moderate quality evidence). 3 ESGE recommends endoscopic resection for the treatment of gastric superficial neoplastic lesions that possess a very low risk of lymph node metastasis (strong recommendation, high quality evidence). EMR is an acceptable option for lesions smaller than 10–15mm with a very low probability of advanced histology (Paris 0-IIa). However, ESGE recommends ESD as treatment of choice for most gastric superficial neoplastic lesions (strong recommendation, moderate quality evidence). 4 ESGE states that the majority of colonic and rectal superficial lesions can be effectively removed in a curative way by standard polypectomy and/or by EMR (strong recommendation, moderate quality evidence). 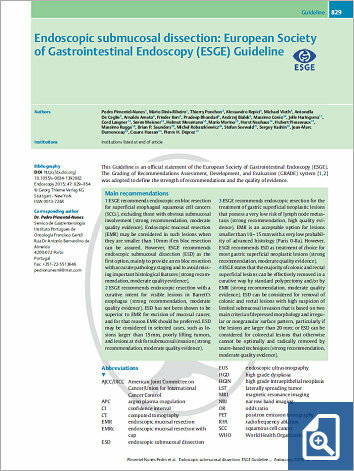 ESD can be considered for removal of colonic and rectal lesions with high suspicion of limited submucosal invasion that is based on two main criteria of depressed morphology and irregular or nongranular surface pattern, particularly if the lesions are larger than 20 mm; or ESD can be considered for colorectal lesions that otherwise cannot be optimally and radically removed by snare-based techniques (strong recommendation, moderate quality evidence).